For those of you who celebrate Christmas, I hope it was a good one. Happy New Year to one and all. Be sure to check out several updates on georgeswebpage.com. It's back to Florida soon for a couple of weeks. My next blog will be from there. 4 WHAT DO YOU THINK YOUR MOM AND DAD HAVE IN COMMON? 5 WHAT DO MOST PEOPLE DO ON A DATE? 6 WHEN IS IT OKAY TO KISS SOMEONE? 7 IS IT BETTER TO BE SINGLE OR MARRIED? It's amazing to me that White House Chief of Staff John Kelley took the job to begin with never mind lasting as long as he did. Consider: Kelley is a retired career marine corps general. He's as "gung ho" as they get. Then he's offered a job by a draft-dodging scum bag and instead of walking away in disgust, he takes it. I guess it's true that high level officers become political after a while. Oh well. Better late than never, Kelley. You finally realized the mistake you made. Ask kids today if they know what Pearl Harbor is. Ask them how the U.S. got into World War II. The responses will probably sadden you. Today is Pearl Harbor Day. 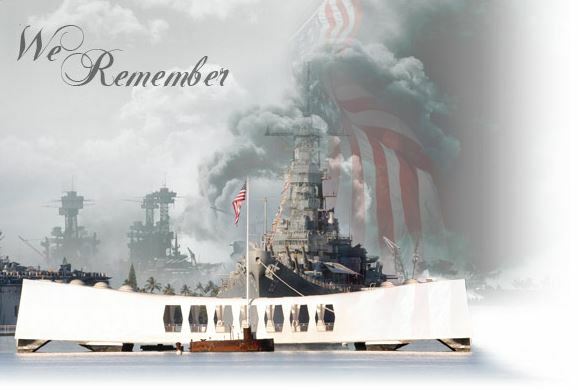 Seventy seven years ago the Japanese bombed U.S. naval forces at Pearl Harbor thus our entry into World War II. The rest, as they say, is history. I wonder if anyone is studying it any more.